The 5 Ks are forms of identification shared by the entire Khalsa Panth (the Sikh community), and were created by Guru Gobind Singh in 1699. In 1699 at Vaisakhi (the Harvest festival in the Punjab, now celebrated as the Sikh New Year), Guru Gobind Singh came out of a tent with a sword and challenged any Sikh who was prepared to give his life, to enter the tent. The Guru returned with the sword covered in blood. This process was repeated four more times, with the crowd becoming increasingly concerned - until the five men emerged from the tent with the Guru wearing turbans. 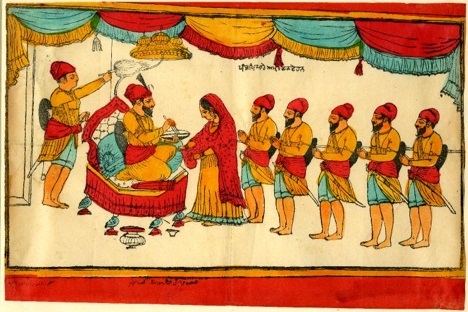 The five men became known as the "Beloved Five" (Panj Piare) and were later baptised into Khalsa Panth by the Guru. To identify them as part of the Khalsa Panth. To bond the members of the Khalsa Panth closer together. Because each of the Ks has a particular significance. Uncut hair (Kesh): Sikh men and women do not cut their hair. Sikh men should not cut their beards, and Sikh women are forbidden to cut any body hair or trim their eyebrows. Wearing a steel bracelet (Kara): Sikhs wear the Kara, which is made of steel rather than gold or silver, because it is not an ornament. Carrying a wooden comb (Kanga): The Kanga symbolises a clean mind and body, and the importance of looking after the body which God created. Carrying a steel sword (Kirpan): The Kirpan is a symbolic sword that can be worn under or over clothing. It can be just a few inches long or several feet.